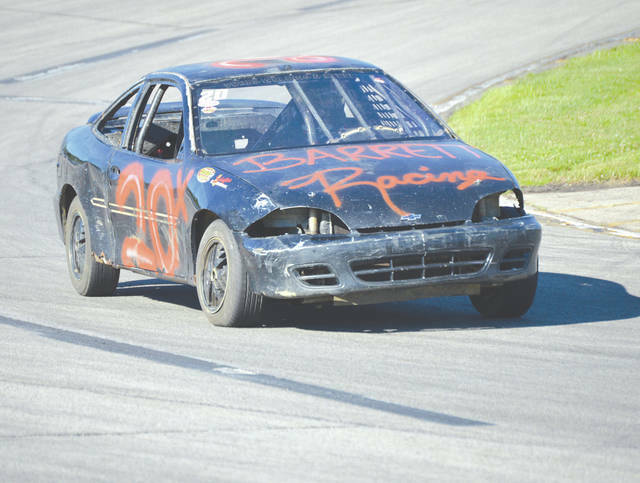 Spring Valley’s Ryan Barrett (20X) and the rest of the Compact stock car racing class will be part of a four-event race night, Friday July 13 at Kil-Kare Raceway. The Street Stock race class will also join Kil-Kare’s regular lineup of Late Model and Modified racers on Friday. XENIA — After an apparently successful trial run on July 8 in an event that was billed as the Sunday Slam, Friday Night racing will seem just like old times, when Kil-Kare Raceway plays host to four classes of auto racing on Friday, July 13. Unofficially, it’s been more than a year since Kil-Kare Raceway played host to four classes of auto racing on a Friday night. The track hosted a four-race feature slate during the 2017 season, but held its races on Sunday afternoons. The Gem City Auto Racing group began the 2018 series with Late Model and Modified events on Friday nights this season, but Friday’s event looks to be the first time in over a year that the paved 3/8-mile oval will play host to a four-race field on that day. The news is so new that at 8:30 p.m. July 10 the race schedule had yet to be posted on the kilkare.com website. Gem City lists a July 13 race date at Kil-Kare, but with just Late Model and Modified cars on the schedule. While the circle track will have its full plate of racing going on Friday night, the drag strip will have a full day of racing set for Saturday, July 14. The Extreme Outlaw drag racing series will host a $3,000-to-win Super Pro event. Extreme Outlaw Junior Dragsters, regular Junior Dragsters, three classes of index racing (4.50, 5.50 and 6.50), a trio of Extreme Outlaw series racing categories, a Pro class competition and a Street Car Shootout are scheduled for all day Saturday. Gates open for the drag race at 11 a.m. with track time trial runs beginning at noon. Extreme Outlaw qualifiers are scheduled to run at 3 p.m., 4:30 and 6.
https://www.xeniagazette.com/wp-content/uploads/sites/32/2018/07/web1_BarrettCompact_PS.jpgSpring Valley’s Ryan Barrett (20X) and the rest of the Compact stock car racing class will be part of a four-event race night, Friday July 13 at Kil-Kare Raceway. The Street Stock race class will also join Kil-Kare’s regular lineup of Late Model and Modified racers on Friday. Contact John Bombatch at 937-372-4444, Ext. 2123. For Kil-Kare Raceway ticket information, call (937) 429-2961, or visit kilkare.com.